In most mechanical and boiler rooms, pipes and fittings such as elbows and tees are insulated with conventional pipe insulation. However, in the author’s experience, the components (valves, strainers, pressure regulators, etc.) are either only partially insulated or totally uninsulated (bare). This lack of proper insulation wastes energy, creates a health and safety issue (i.e., hot components can cause burns), and produces unnecessary carbon dioxide emissions, and, in unventilated mechanical rooms, the resulting high air temperatures create a stressful work environment. In this article, we’ll explore simple solutions to improper insulation and a means of estimating the energy savings. The National Mechanical Insulation Committee has recently developed a simple calculator for the Mechanical Insulation Design Guide (MIDG) that is available at www.wbdg.org/design/midg_design_echp.php. The MIDG is part of the National Institute of Building Sciences’ Whole Building Design Guide (WBDG). This web-based calculator enables users to calculate energy savings from bare and insulated pipes and flat surfaces. It is based on Standard ASTM C680 and has been validated for accuracy. To demonstrate how this calculator can be used for evaluating the impact of insulating a pipe component, let’s run an example problem. Consider a 6 in. NPS pipe carrying 350°F (177°C) steam, operating full time, in a 90°F (32°C) room with 0 mph wind, and evaluating it with fiberglass pipe insulation with all-service jacket and a cost multiplier of 1.0 (this term refers to a multiplier for the calculator’s default value of the installed cost per lineal foot of the insulation material, which is the sum of the insulation material and labor to install costs. These values must be assumed or obtained from an insulation contractor). We obtain the following results from the calculator (Figure 1). 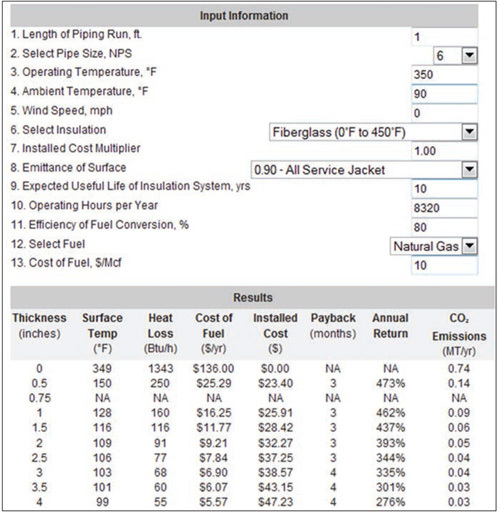 The screenshot shows that for natural gas costing $10 per MMBtu, with only 1 in. (25.4 mm) of insulation, we obtain a predicted payback of about 3 months for an annual return of 462 percent. In fact, the cost of fuel saved per lineal foot (LF) is the cost per LF with 0 in. of insulation minus the cost per LF with 1 in. (25.4 mm) of insulation = $136/LF – $16.25/LF = $119.75/LF. This represents an 88 percent heat loss reduction, a significant savings under any circumstance. Likewise, the last column shows CO2 emissions are predicted to be reduced by 0.74 – 0.09 = 0.65 metric tons annually per LF of pipe. What does this mean for a 6 in. NPS gate valve with an ANSI rating of 300 (i.e., rated for 300 psi)? ASTM C1129-89 (2008), Standard Practice for Estimation of Heat Savings by Adding Thermal Insulation to Bare Valves and Flanges, includes Table 1, which gives bare valve surface area values for a range of pipe sizes and ANSI pressure ratings. Predicted annual emissions savings = 5.6 LF × 0.65 MT/year/LF = 3.64 metric tons. That’s $670.60 in annual energy savings for a single 6 in. NPS gate valve. And, if we assume that the installed cost of custom removable/replaceable (R/R) insulation blankets is twice as much as 5.6 LF of preformed pipe insulation on this 6 in. NPS pipe, the payback is still 6 months. If we were to use an insulation kit to make the R/R blanket, on site, based on experience, I estimate that the installed cost would only be about 20 percent greater than that for conventional pipe insulation. Therefore, the predicted payback would only be about 3.6 months. Regardless of the exact assumed installed cost value, the payback would only be several months. A more conservative case would be for heat distribution piping system carrying hot water, at 180°F (82°C), from a furnace that operates only half of the year, or 4,380 hours per year (Figure 2). Predicted annual energy savings = 4.05 LF × ($17.43/LF – $2.35/LF) = $61 per year. Predicted annual emissions reduction = 4.05 LF × (0.10 – 0.01) MT/yr · LF = 0.36 metric tons. While not nearly as impressive as that for the hotter valve that carries 350°F (177°C) steam year-round, the savings from insulating just one 6 in. NPS gate valve carrying 180°F (82°C) hot water is still compelling. If we again assume the installed cost of custom made R/R insulation is twice that of preformed fiberglass pipe insulation, the payback would be about 42 months. If using a modular insulation kit to make R/R blankets, the installed cost would be about 20 percent greater than that for pipe insulation. Therefore, the payback would be about 2 years. Are these energy savings a significant portion of all the space heating needs? In a recent article,1 Chris Crall and Ron King reported on their mechanical insulation survey for the State of Montana. They surveyed mechanical rooms in 25 buildings that are part of the state capital system in Helena, Montana, representing about 1.3 million ft2 (121,000 m2) of buildings. The authors focused on identifying pipe components and equipment, located in mechanical rooms and boiler rooms, that were either bare or had severely deteriorated thermal insulation. They came up with a total of about 3,500 items. They calculated the total annual savings from insulating these components would be about 6 billion Btu, or about 8 percent of the total natural gas used to heat these 25 buildings annually. Figures 4 and 5 show bare pipe components in several buildings’ mechanical rooms. 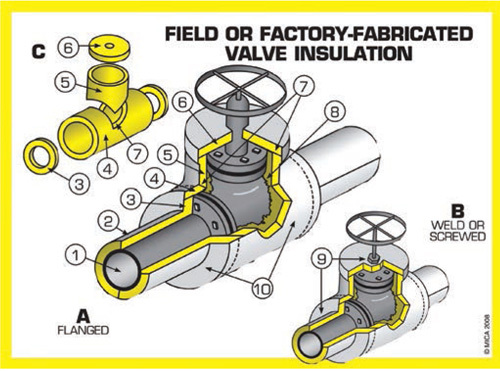 To insulate these difficult shapes, one option is for the insulation contractor to craft insulation pieces using preformed pipe insulation and then install these over, for example, a gate valve; Figure 3 shows how this can be done. 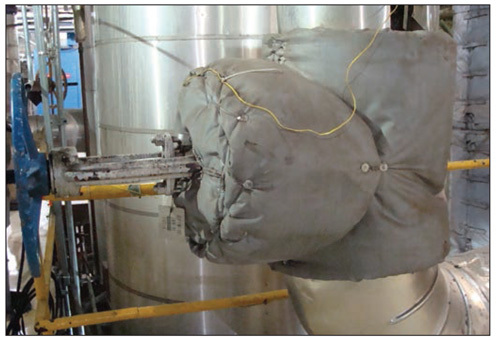 A second option is to use R/R insulation blankets. These usually are custom made and require the fabricator to send someone to the site to measure the surfaces, then design the R/R blankets, fabricate the blankets in a shop, bring the blankets to the job site, and install the blankets. 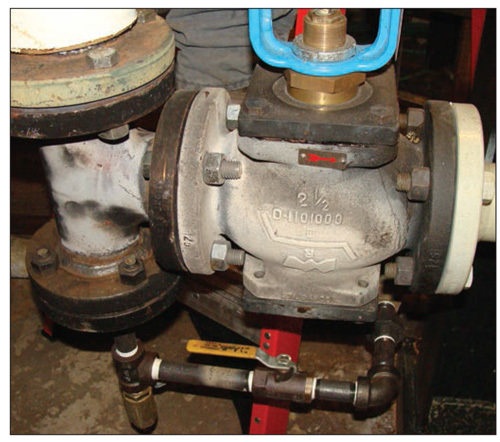 Figure 6 shows a custom R/R insulation blanket on a gate valve. The photo shows that these blankets require a certain amount of skill and training to design, fabricate, and install correctly. When done well, and in such a way that all the bare surfaces are insulated, this option results in insulation that can be removed for maintenance or inspection and then reinstalled fairly quickly. 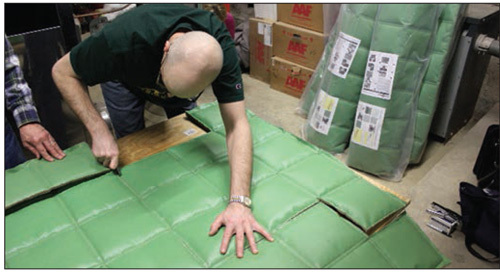 The fabrication of these blankets can be done following either a project-specific specification, prepared by the architect or engineer, or following the indoor requirements section of industry standard ASTM C1695-10, Standard Specification for Fabrication of Flexible Removable and Reusable Blanket Insulation for Hot Service. 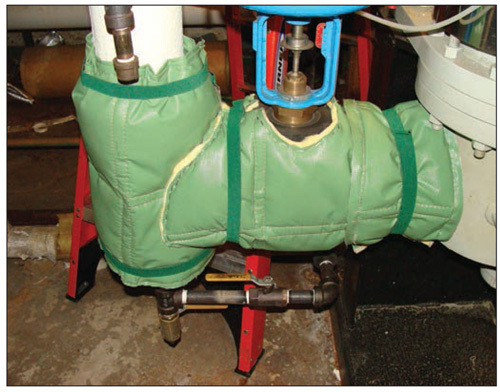 Another option is to use a modular thermal insulation blanket kit that meets ASTM C1695. This allows the contractor to fabricate and install R/R blankets on the job site using standardized materials. In addition, using a kit avoids the delay required of custom-made R/R blankets. While a kit has a fixed thickness, the first inch of insulation reduces heat loss by at least 88 percent and provides the shortest payback (as the reader can see from reviewing payback values from Figure 1 and Figure 2. Overall, a modular kit allows pipe components to be insulated easily and quickly. Modular insulation kits for R/R blankets, which meet the indoor requirements section of ASTM C1695-10, are commercially available. Figures 7 and 9 show how a modular insulation kit can be used to do this. Many opportunities exist for energy savings in institutional buildings that use district heating systems, with a mechanical room for each building, or a boiler room where steam or hot water is generated for heating each individual building. Typically, there are many heat distribution pipe components left either uninsulated or partially insulated. If you can walk into a mechanical or boiler room and see bare steel on operational heat distribution pipe and equipment components, then thermal energy is being wasted. And, this thermal energy waste can be corrected simply by insulating those bare components. In one study, insulating these components has been predicted to comprise 8 percent of buildings’ total fuel use for heating. Payback periods of less than 1 year, and even as short as several months, are common when insulating these previously bare components. 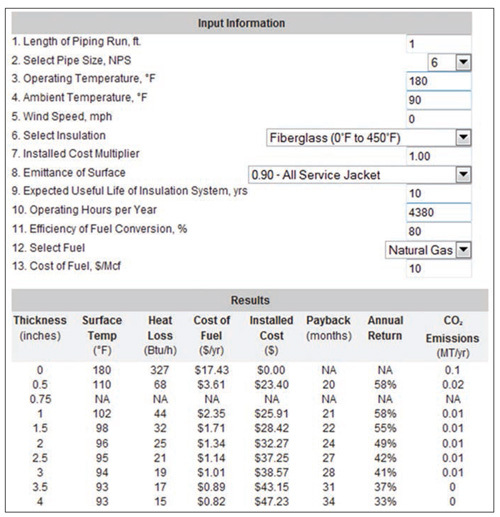 Estimates of the energy saved, payback, and reductions of emissions can be made using the Mechanical Insulation Design Guide’s heat loss calculator. This is part of the Whole Building Design Guide and was developed with assistance from the U.S. Department of Energy. 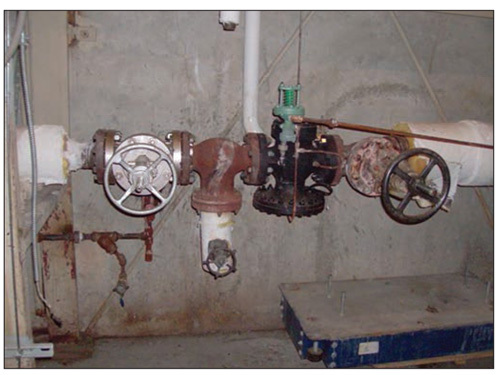 It is recommended that mechanical designers and facility owners/operators learn to survey their mechanical rooms and boiler rooms for bare pipe components and equipment. Although conventional, permanent types of insulation work well, they do not normally provide easy accessibility for maintenance personnel. The author recommends using removable/reusable insulation blankets for these components. The blankets can be either custom-made or site-made using modular thermal insulation kits designed for this purpose. 1. Crall, C.P., R.L. King. 2011. “Montana mechanical insulation energy appraisal.” Insulation Outlook (5). http://tinyurl.com/3zzt6yg. ©2011 ASHRAE. Reprinted by permission from ASHRAE Journal (October 2011), www.ashrae.org.